“Welcome to our living room!” Rolf Carle and Teresa Toro exclaimed cheerfully as they looked up from their circle of lawn chairs, tea lights and supplies gathered in the center of their makeshift quarters for the evening. The two Williamsburg residents are no strangers to these kinds of protests: They have been involved in the struggle to conserve the neighborhood’s waterfront for almost 30 years, and in fact met 15 years ago while protesting the creation of a power plant on the shore. The saga of Brodsky and Bushwick Inlet Park has been going on for quite some time. The park, which was promised by the city’s former administration to the neighborhood in 2005, was part of a rezoning deal that allowed the area to get “upzoned” to facilitate the creation of more luxury buildings near the waterfront. While most of the land that is supposed to compromise the 28-acre park has already been bought by the city, Brodsky hasn’t agreed to sell his 11-acre share, which runs directly through the middle of the proposed park. Now, the city has finally stepped up its game and set an offer of $100 million on the table, which Brodsky has thus far rejected. 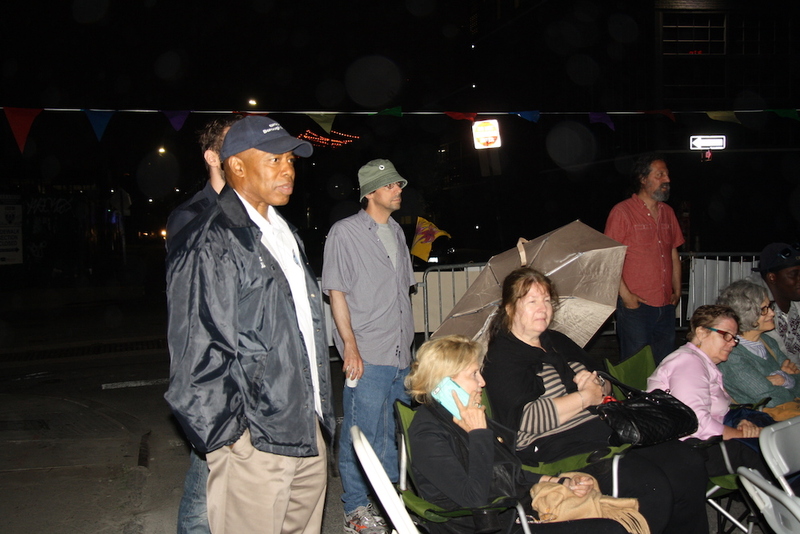 In June, Brooklyn Borough President Eric Adams, along with activists of the Friends of Bushwick Inlet Park organization and Congresswoman Carolyn Maloney, set up a large countdown clock to display the number of days left on the city’s offer. Saturday’s sleep-in marked the halfway point of 30 days. Meanwhile, Cushman & Wakefield, the realtors who are managing the property for Brodsky, have announced that the property is up for auction, and set a deadline for July 20th for any offers, a move that many activists think is a sign on Brodsky’s part that he’s shopping around to see what other offers he can get. Neither Brodsky nor a representative at Cushman & Wakefield were available for comment. 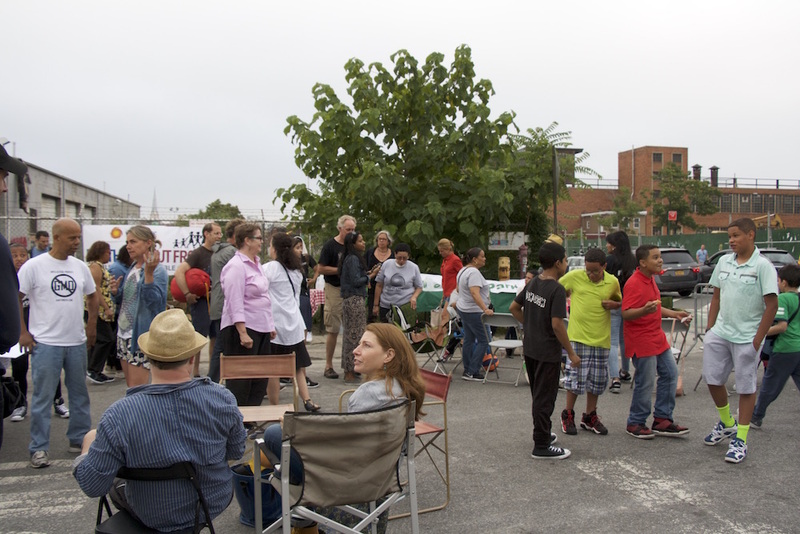 The sleep-in was the brainchild of Borough President Adams, explained Steve Chesler, of Friends of Bushwick Inlet Park. 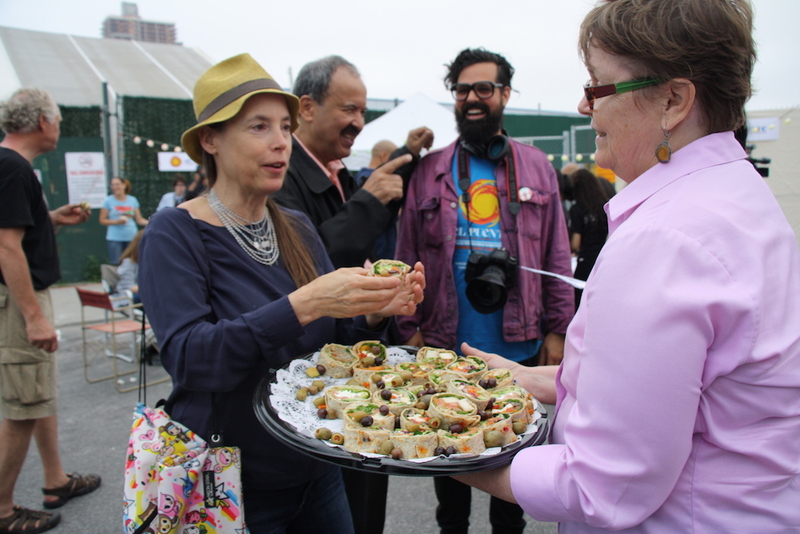 Together with local activists, longtime residents, and elected officials, the event was a protest with the look and feel of a neighborhood get-together. 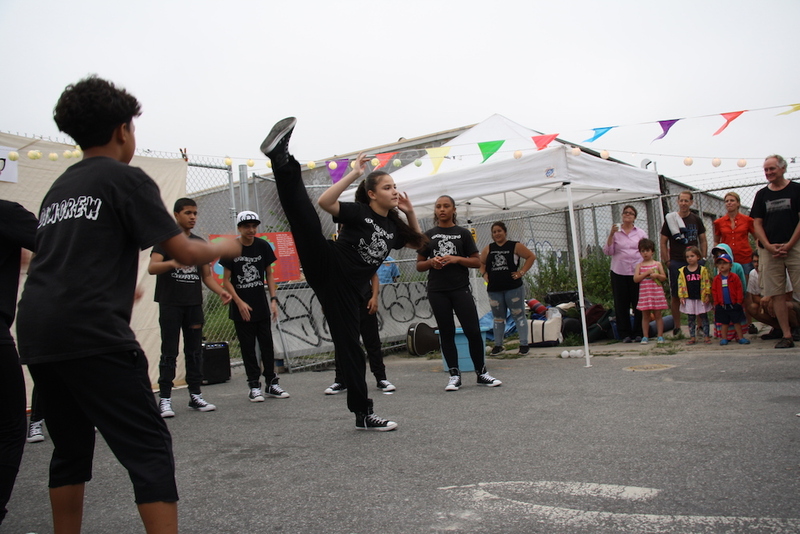 Local Williamsburg vendors provided sandwiches, fruit, snacks, and drinks, while the teen dance group Dreams in Motion, from the nonprofit El Puente delivered an energetic dance routine among claps and hoots of support. Assemblyman Joseph R. Lentol, who heads the 50th District, was also present, and expressed hope that this gathering would indicate to Brodsky that Williamsburg residents were serious about their park, and that the city needed to do more than simply leave its offer on the table. “I’m hoping the city will sit down and negotiate more with him,” Lentol said, adding that Brodsky has sold land to the city before (the land for the East River State Park, which was sold for $10 million in 1999), and will most likely do so again if he can get a higher sum. “He thinks he can get more money. He is a businessman, after all,” Lentol said. 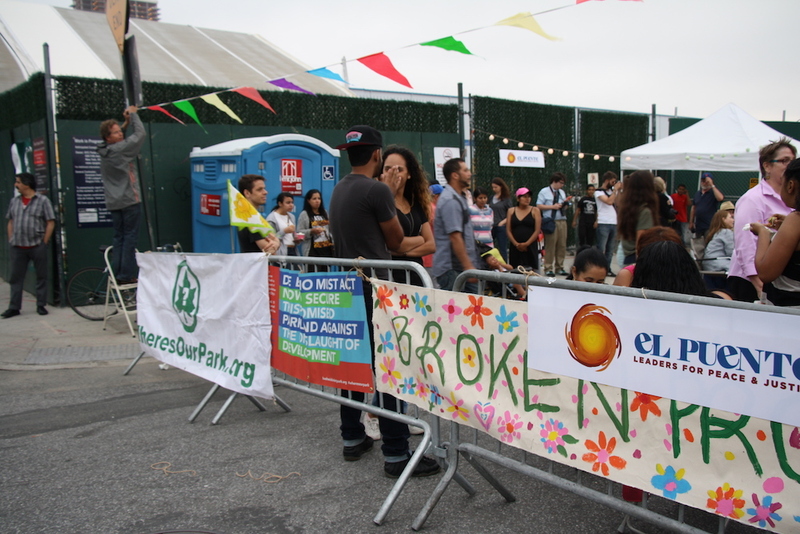 A recent report by the Friends of Bushwick Inlet Park and the Open Space Alliance for North Brooklyn has evaluated the property’s worth to lie between $46 million to $116 million – “That makes the City’s $100,000,000 offer an excellent starting place for the parties to negotiate a resolution to this important matter,” the study concludes. According to Brooklyn Paper, Brodsky is hoping to fetch $325 million for the property. Lentol was confident that the city’s current administration will “do the right thing” and “keep its promises” by continuing to negotiate with Brodsky until an accepted price can be found, he said. After the dancing and some refreshments, Chesler’s brother Craig played songs on his guitar and ukulele. Afterward, author and Williamsburg historian Daniel Campo gave a lesson on the history of the waterfront, and its evolution as a community space throughout the decades. As the evening progressed, storm clouds threateningly gathered, although the good cheer of the group was hard to dispel. Congresswoman Maloney and President Adams appeared later in the evening, with full intentions to sleep over, despite the rain which had begun falling down on the gathering, first as a gentle drizzle and then a full-on pour. For Adams, the weather served to show the protesters’ resolve. “I’m happy that it’s raining, it shows that our commitment is real,” he said. 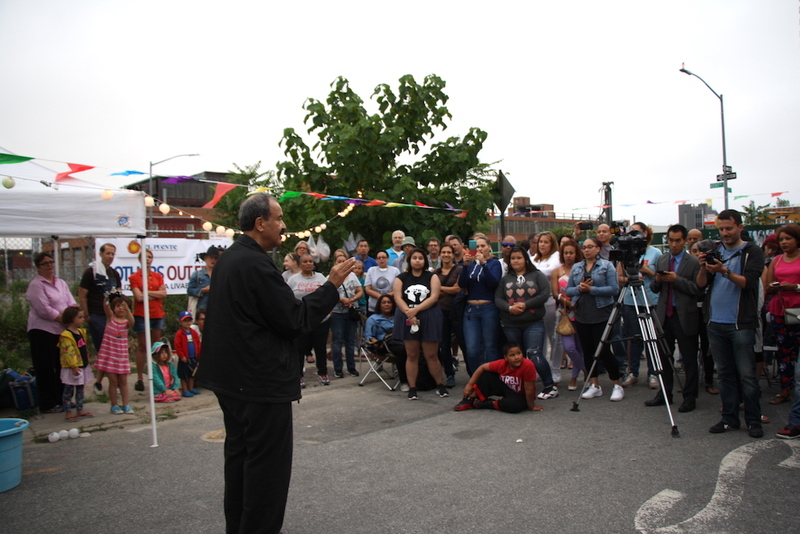 “A park is a place for families to thrive,” he continued, emphasizing the importance of the park to the neighborhood’s community. “We can’t allow it to go to auction, we can’t allow it to go to imminent domain,” he said forcefully, referring to the city’s last-resort option of claiming the land from any private buyer who purchases it– at market price, however. Maloney was equally forceful. “We’re asking for [the city] to keep the contract with the neighborhood,” she said among cheers. “We said yes to the upzoning if you give us the park. This was a contract, this was a deal, this was a promise,” she yelled, slamming her fist on a table for emphasis as everyone cheered and huddled around her to escape the deluge. Chesler explained that as of now, Mayor Bill de Blasio has been silent on the issue since placing the initial offer of $100 million. Nonetheless, he, along with the other activists present at the protest, were confident that their voices would be heard. Despite the forceful rain that would go on all night, the rapidly dropping temperatures, and the fact that almost no one had set up their tent yet, the good cheer of the group could not be dampened. “I, for one, can’t wait to see Adams in his pijamas!” Maloney said jokingly.